My purpose in creating this blog is to explore the history of Christianity that developed East of the ancient Roman world and which is called today The Holy Apostolic Assyrian Catholic Church of the East. The church is in no way a member of the Roman Catholic Church but has the term Catholic in much the same way that we Orthodox use the term. It has also been called the Assyrian Church of the East, The Church of the East, The Persian Church or, unofficially and somewhat in a derogatory manner, the Nestorian Church. In this blog I prefer the term: The Church of the East. Here is my attempt at a succinct definition of what the Church of the East is in short paragraph. Christianity developed throughout the Roman Empire and by the forth century crystallized as the pentarchy of the patriarchs of Rome, Constantinople, Alexandria, Antioch and Jerusalem. At the same time, the Gospel was preached and received in Mesopotamia and went out across the Persian Sassanian Empire (although it may have begun during the late Parthian period). This Church of the East structured around the bishop, later Catholicos Patriarch, in the capital of the Persian Empire, Ctesiphon, and she missioned across Asia through Afghanistan, India and across to China and Mongolia. The Church of the East is Christianity as developed East of the traditional and ancient Eastern Orthodox world, sharing much theologically and philosophically with Greek speaking Christianity and yet remaining in practice and polity independent. The first great task will be to understand why Eastern Orthodox do not share a communion with the Church of the East. This exploration is meant as a study of a ancient Eastern Christian Church that developed wholly within a pagan (later Islamic) world, which was ambivalent at best and genocidal at worst to the name of Christ. I enter this discussion in the midst of a world increasingly pagan and anti-Christian and I seek to find some sense of how and by what means the two great worlds of Eastern Christianity split at the cusp of Islam's advent. Next week, I shall post about the last time these two churches shared a Eucharist. From there, we will have a good vantage point to begin to see where the two Christian worlds where in relation to each other and what was the substance of their separation. Khayit akhi! This is an important and much needed contribution to the Eastern Orthodox understanding of the Church of the East offered by someone who has a unique vantage point on this topic. I'd like to suggest that you also consider your audience those Assyrians who want to know more about the Orthodox Church. Basima Raba akhi Ninos. Ultimatly, there is much to be gained for both. 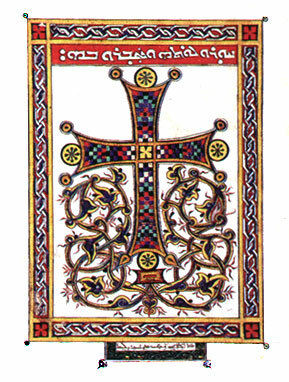 The semetic East has certain blessings in how she has managed to express Christ in anti-Christian cultures and if we are to do well in the current post-Christian reality, it is good to study the Church of the East, which has not only survived but undertaken some of history's greatest missions as a church within a pagan then Mohammedan culture. The Church of the East has much to gain from Orthodoxy's work in carfule articulation of more modern day topics such as bioethics, social justice, etc. Some great traditions have been forgotten in the Church of the East, which Orthodoxy preserves such as Holy Unction and Icons. There is much to explore, but much ground is being broken. Part of this blog's purpose is also to introduce people to great texts exploring the topic. My hope is that both sides engage a traditon that is, authentically, mutual inheritance of Orthodoxy and the Church of the East. I hope the suggested readings at the foot of postings are picked up by as many in one Church as in the other. Thank you for offering to lead a discussion on this subject. I have long wondered about the "Nestorians" because, as you point out, there doesn't seem to be a very clear definable point of separation. I would add that the same seems to apply to a certain extent between the Chalcedonian and non-Chalcedonian Churches, considered individually. For instance, the Armenian Church spent about 600 years deciding whether or not to accept Chalcedon, and ended up rejecting it mainly for political reasons. We'll get going on the nature of what does end up seperating us. The history will get more clear, but indeed there is not an exchange of excomunications or anathemas as there was with the One-Nature confessing churches of Alexandria and Antioch. Still, there is a good strong history to be told. I look forward to your observations and comments. shlom lokh abun aphrem wtawdi saggi 'al mawd'onuto dakhyono waqnumo wafay wfarsufo. Thank you brother. I hope we get to hear about how the Church of the East theology sounds to our Suroyo brothers, as we begin to work with actual Syriac texts of the Assyrian Church's own writers. Of course that means: "Lord, we worship your divinity and humanity without division". What made you leave your Mother Church and join a different Church? Isn't the Church of the East still on the steps of the Apostles and has not embelished in its liturgy but remained simple and true to the faith ? I’m over six years late to the party but this is really a fantastic blog. I appreciate this kind of work, all the best to you.